According to the latest statistics from the FBI, a burglary occurs somewhere in the United States every 14.6 seconds. Today's criminal has become more and more adept at entering homes and quickly finding your most valuable and precious belongings. Protect yourself against crime by installing a security system from Link Interactive, featuring 24/7 central-station monitoring and cellular-based automation. Here you will find all the necessary equipment and technology to keep your loved ones and possessions safe. 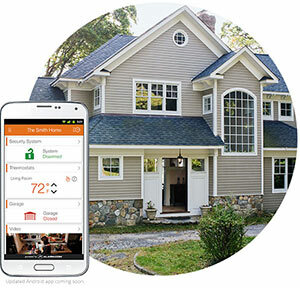 Take control of your home’s safety today with the help of Link Interactive. In case of an emergency, other security systems claim to have your back by sending you text message alerts, but what happens when you need real help and you don’t have access to your phone? With Link Interactive, your system is backed up by 24/7 central station monitoring, giving them the ability to contact you through a 2-way voice panel, call in EMS when you don’t respond, and even call the police for you if your home is invaded. No matter what the situation, WE HAVE YOUR BACK. How smart is it to let your family’s safety depend on your internet connection? Every time your internet breaks down (and we know this happens more times than you’d like), your security may be exposed to a fatal flaw. With Link Interactive's cellular based security, you won’t have to worry about the risks associated with an internet dependent system. We understand that you don’t want to deal with the hassle of cleaning up your old security system, which is why we’re offering to do it for you. You’ve already invested enough time and money into your old system, so let us take matters into our own hands and bring your security up to date. Our takeover program makes it easy for you to switch from your old equipment, to Link Interactive's interactive system. With us, there’s no need for you to waste money on new equipment, and we can help you can save some time by expanding your old security into a state of the art system, offering remote access and automation of the highest quality. Home security doesn't get much easier than this. You can get the same quality protection without having an installer. You'll never have to worry about the risks associated with letting a stranger into your home. DIY systems allow you to customize your security, so you know that the products you're getting are right for your home and your family. DIY customization also allows you to work within your budget, giving you the ability to access quality protection at an affordable price. It's easier than you think! Setting up a DIY alarm system is straightforward process. You don't need to be an electrician to get the job done. 92% of Link Interactive customers said it was EASY to install their system! Homes don't take precautions. Installing a security system into your home is one way to make sure your home is safe from invasion. Burglars HATE cameras because they create evidence—seeing a home with installed cameras will sometimes be enough to keep burglars away from your home.